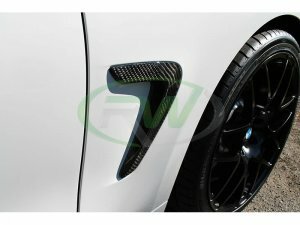 Do you want to complete your carbon fiber theme on your BMW F32/F33/F36 4 series? RW Carbon has the perfect accessory with these carbon fiber fender grille overlays. These grilles simply lay over your existing fender vents with some 3M tape or adhesive. They are build using altra thin carbon fiber with a thin ABS plastic backing. Each one is then finished with a high quality clear coat. This step provides a perfect shimmer and is a great way to protect the CF from fading and/or cracking.